11.21.2016 — Ian McFarlane, Senior Associate at MKA, was named one of Building Design + Construction’s "40 Under 40" class of 2016. The youngest of 13 engineers with a Senior Associate title, Ian stands out as an exceptional leader whose contributions to the engineering profession during his 9-year career with MKA exemplify both design leadership and professional excellence. Ian is sought out for and remains an active contributor and participant in the development of codes and practices for the national structural engineering profession. Congratulations Ian! 11.04.2016 — Congratulations to our Chairman and CEO, Ron Klemencic, PE, SE, Hon. AIA, who received the Fazlur R. Khan Lifetime Achievement Award from the Council on Tall Buildings and Urban Habitat (CTBUH) last night in Chicago. Joining Ron at the awards dinner were MKA Senior Principals, Dave Eckmann, PE, SE, AIA and Jon Magnusson, PE, SE, Hon. AIA — along with MKA President Don Davies, PE, SE. Jury member Abrar Sheriff said, "Ron Klemencic is inarguably one of the biggest influencers in the fields of structural and civil engineering today. Ron has acquired a reputation in the industry as a deviceful problem solver, and for good reason – he has the ability to craft solutions at the highest and broadest levels, a quality that shines brilliantly in all of his work. " Congratulations to Ron for being recognized for his incredible leadership in the engineering community! 08.30.2016 — A new CTBUH research group is rethinking the traditional notion of the elevator in tall building design. The group’s discussions center around MULTI, an innovative rope-less, non-vertical elevator system being developed by thyssenkrupp AG. Surprisingly, in its over 150-year history, the basic concept of the elevator has not changed, but the new technology being developed by thyssenkrupp allows mobility in both vertical and horizontal directions within a building by replacing ropes with linear motors. 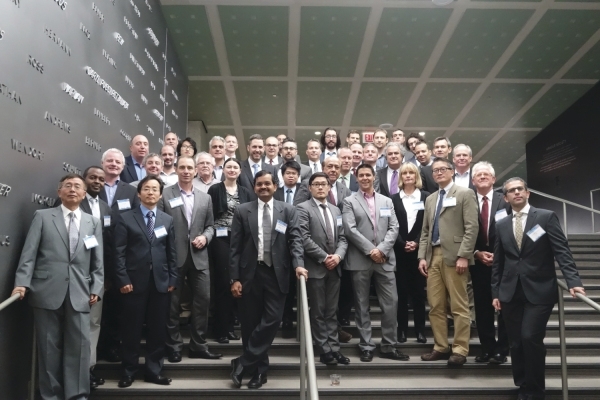 Identified for his expertise in tall building structural design, MKA’s Principal, Rob Chmielowski, P.E., S.E., participated in the kick-off meeting of this special CTBUH research group in Chicago on August 30th. Research on the topic will continue for the next two years and investigate how this new technology could impact future designs of our tall buildings and our cities. For more information on this research project, visit the CTUBH website here. 08.27.2016 — Since 2014, MKA has chosen a Community Service project to tackle in the Greater Seattle area. The year starts with a call for MKA volunteers and the selection of an overall project manager. Brainstorming and project selection happens next, and then the design teams go to work creating detailed plans, supply lists, and much more – in anticipation for a well-coordinated build day. For this year’s project we planned several major improvements to Dr. Jose Rizal Park in the Beacon Hill neighborhood of Seattle. The park contains an orchard perched along the west slope, overlooking downtown. City Fruit, a non-profit organization, along with the park steward and volunteers maintain the orchard and harvest the fruit to benefit the Beacon Hill community and for use in local food banks. 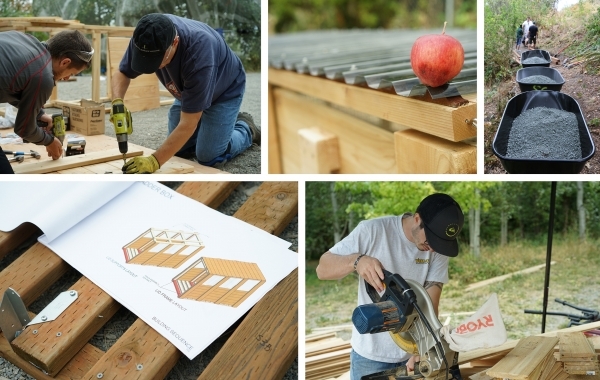 MKA’s task was to extend an existing trail for better access to the orchard; build secure, on-site storage boxes for tools used in the maintenance of the orchard; and to build a 3-step composting system for fallen apples. After six months of planning and design, 40+ MKA volunteers were on-hand on August 27th to complete the project. Take a look at our short video here to see what the team was able to build in one day! Our thanks to Seattle Works for assisting us with logistics and coordination for the third year running! To find out more about the rich history of the park and its orchard, visit here. 07.28.2016 — Food Frenzy for 2016 is a wrap. 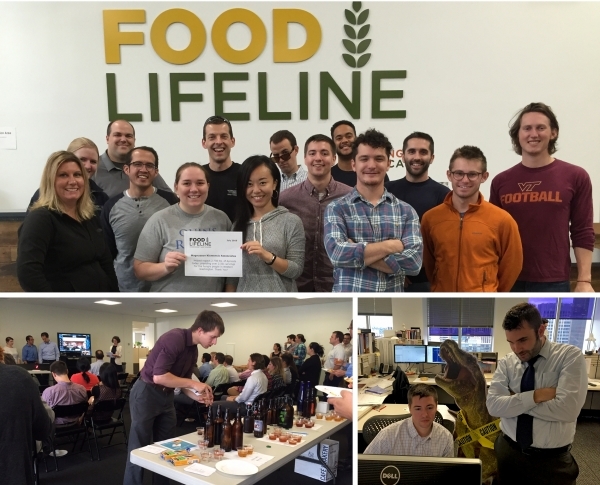 MKA participated in two weeks of fun events — all to raise money for Food Lifeline. Activities included everything from bake sales to trivia competitions. One office favorite was the “Cardboard Cutout Competition.” Staff donated dollars to send a large scale cutout to loom over their co-workers desk. Last year it was Justin Bieber, this year it was a T-Rex! And new for this year was the “Guess the MKA Baby Competition.” 25 photos were submitted to the contest. Our BIM Technical Lead, Ben Thomas, was the winner — identifying 16 of his co-workers from their baby photos! MKA’s staff raised $8,016.93, far exceeding our 2015 totals. Staff also helped sort, pack, weigh, and stack nearly 2800 lbs. of food at the Food Bank Volunteer Night. Thanks to Justin Grasse, Jessica Haas, Abby Taylor, Angela Bigelow, Kunal Vaswani, Megan Hays, Travis Corigliano, Eleanor Reynolds, Mandy Chen, Krzysztof Zaleski, Blake Doepker, and Michael Murphy for organizing the individual activities and to ALL our MKA staff for their participation. 06.01.2016 — Another successful year of the ACE Mentor Program of Washington is complete! 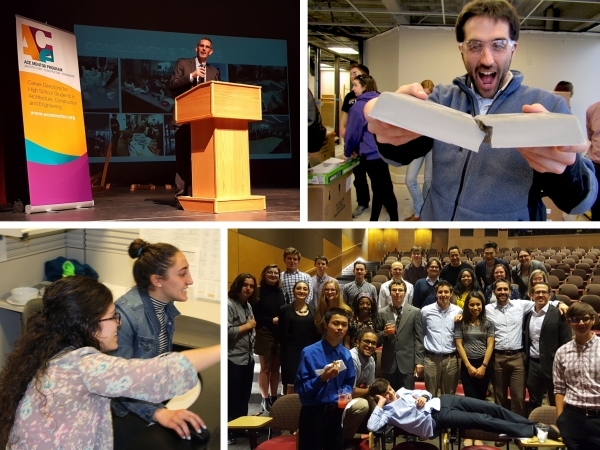 On May 24th our own CFO, Bill Christopher, emceed the Eastside presentation night as two teams made their final presentations, and the following evening six Seattle teams made their presentations at the University of Washington. There were 165 students and 130 mentors who participated this year, meeting bi-monthly at mentor firm offices. The ACE Mentor Program of Washington is free to high school students who want to explore the architecture, engineering, and construction professions. Special thanks to the 19 MKA staff who volunteered their time and talents to mentor the students this year, including Emily Carlip and Brad Strandquist who co-lead Team 2. This is now the 16th year that MKA has been a participant in this great program! 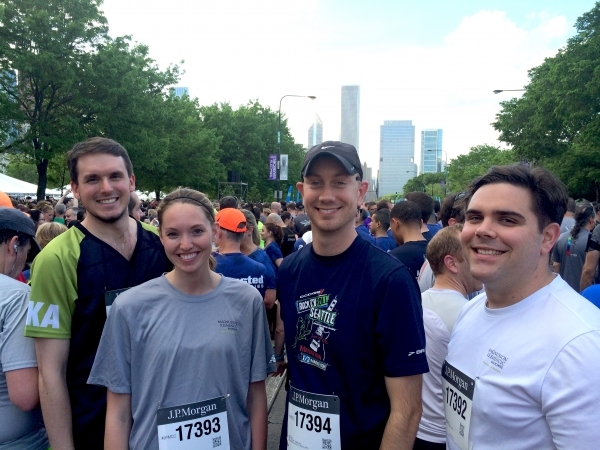 05.27.2016 — Pictured here is Team MKA Chicago at the J.P. Morgan Corporate Challenge last night in Grant Park! (From L to R: Josh Brickman, Bethany Myelle, Adam Theiss and Lucas Cusak.) This was the 35th running of the event in Chicago and served as a benefit and awareness builder for "Get IN Chicago", a not-for-profit dedicated to identifying the most effective ways to reduce youth violence. Nice work team! Jon’s career spans over 40 years in engineering. He joined MKA in 1976 and rapidly advanced to Principal, Senior Principal, CEO, and ultimately Chairman of the Board — a role he held for 18 years. Now a Senior Principal, Jon has worked on projects in 47 states and 49 countries and continues to show leadership inside and outside MKA. The newly elected class to will be formally inducted during a ceremony at the NAE’s Annual Meeting in Washington, D.C. on October 9, 2016. Read more about the newly elected members here. 01.27.2016 — MKA’s Chicago office was pleased to recently host a group of engineering students from MIT. The group led by Senior Principal and Chicago Office Leader, Dave Eckmann, P.E., S.E., AIA and Associate, Adam Theiss, P.E., toured two of MKA’s projects going up simultaneously along the Chicago River’s edge — River Point Tower and 150 N. Riverside. The next day the students were inspired to visit another MKA project, the pavilion at Lincoln Park Zoo. You can view the progress of the two towers by visiting the construction webcam, here. Photos courtesy: Professor John A. Ochsendorf, MIT. 01.19.2016 — MKA President, Don Davies, P.E., S.E., and Senior Associate, Farshad Berahman, Ph.D., are contributors to the current CTBUH research effort studying damping technologies in tall buildings. Don and Farshad are providing their professional knowledge and real-world experience with damping — an advancement that MKA has been putting into practice for decades as we design structural systems for high-rise projects, buildings in seismic zones, and projects that require minimizing vibrations such as performance halls and long-span convention centers. Damping systems specific to tall buildings complement the structural system, providing increased resistance to structural vibrations that can cause discomfort to the building occupants and possible structural damage. This research will produce a comprehensive study of the damping technologies available for tall buildings, describing their function and relationship to other building components. The project is anticipated to conclude in November 2016, and the group involved is pictured above at a recent New York City meeting. For more detailed information about CTBUH and this study, visit here. 01.08.2016 — The ACE Mentor Program for 2015-2016 is in full swing. High school students from the Seattle and Eastside areas are working with industry mentors to learn about architecture, engineering, and construction. MKA is participating as a mentor firm again this year and has 19 MKA staff participating! This year’s project is to design a high-rise residential building located on Ninth and Virginia in downtown Seattle. Teams are given criteria for the building’s program that includes mixed use space, multiple floors of residential units and four stories of underground parking. The teams have 15 weeks to come up with their schemes. The final presentations will take place on May 25th. Good luck to all the teams! To learn more about the ACE Mentor Program in Washington, click here. 01.07.2016 — Ending 2015 with the giving spirit, MKA staff raised $1,153.00 for Treehouse, a Seattle organization that supports foster children, teens and their families. Donations were collected online and also through a multi-day bake sale. Three boxes of toys and clothes were also delivered to the Treehouse Warehouse just in time for Christmas. Thanks to everyone who participated to support Treehouse!